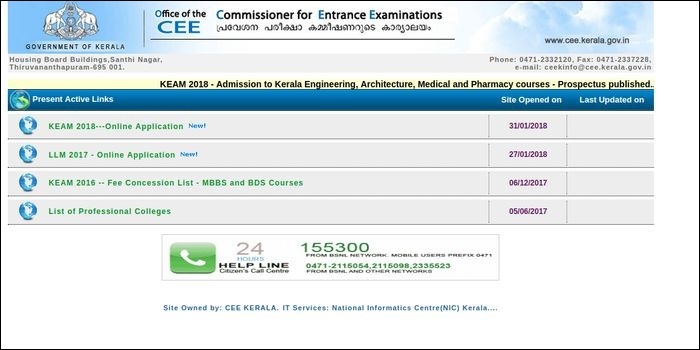 CEE, Kerala has announced the availability of KEAM application forms from February 1, 2018. Candidates can fill the online application form of KEAM till February 28. They will also be required to upload their signature, photograph and left thumb impression while filling the application form. All applicants must take a printout of the filled in application form and send them along with the specified documents by March 31, 2018 to the CEE office. Check KEAM details below. KEAM 2018 will be held on April 23 & 24 across 15 cities and towns of Kerala as well as Mumbai, Delhi and Dubai. Candidates applying for the Dubai centre will have to pay Rs 12000 additional to the application fee. Step 4: Pay Application Fee of Rs 700 (Gen/OBC) and Rs 300 for SC. There is no application fee for ST candidates. If payment is successful, the payment tab will be green. If the photograph uploaded and the one affixed in the print-out are different, the application is liable to be rejected. If applicant’s signature and thumb impression are unclear and not genuine, the form will be rejected. Candidates are required to attach the proof for Nativity along with the printout of the application. If this is missing, the application is liable to be rejected. Candidates whose application form printout along with the documents reaches the CEE office after March 31 will not be considered. How to check KEAM 2018 application status? Candidates can see the 'Application Status' bar in the home page of the online application. Once the application is received and scrutinized by CEE, the ‘Received by CEE’ status will turn light green in colour. In addition, all candidates will also be sent an SMS to their mobile phone. Candidates paying by E-Challan must ensure that the post office officials must record the transaction number and stamp the challan copies. I forgot my keam password. What will do for getting my password? Hi, I am preparing for keam 2019, I got my admit card today. It's written defect in non creamy layer for community field. Can I correct it?